Increasing the pedaling comfort and efficiency of the tandem drive train has been the main focus of performance tandem designers, davinci Designs. So what comprises the independent coasting mechanism or 'ICS'? 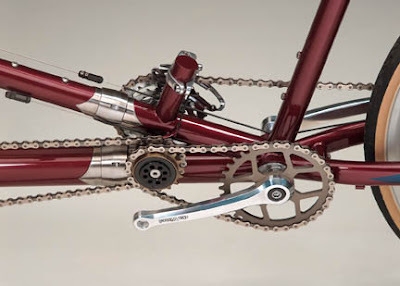 "The main component of da Vinci Designs’ ICS is an intermediate drive shaft six inches in front of the rear bottom bracket. The intermediate shaft has two single-speed freewheels on the left side that are independently driven by the cranks at twice the rotating speed and half the torque. On the right side of the shaft, four Hyperglide™ cogs drive the bike. The chain rings are half the size as those on a conventional tandem because of the double rotation of the intermediate shaft. The combination of 12-, 18-, 24-, 30-tooth driving gears equals 24-, 36-, 48-, 60-tooth chain rings." Tandem addendum: If you are required to use a tandem to ride with your Italian wife/girlfriend, Campagnolo is still the only acceptable component group. No additional drivetrain mods are acceptable. Chainrings with 54 teeth or more are prefered. 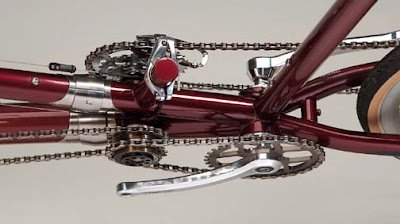 If using an 11-23 cluster, the use of a 53 tooth chainring is acceptable. Furthermore, cantilevers as well as drag brakes are strickly forbidden.